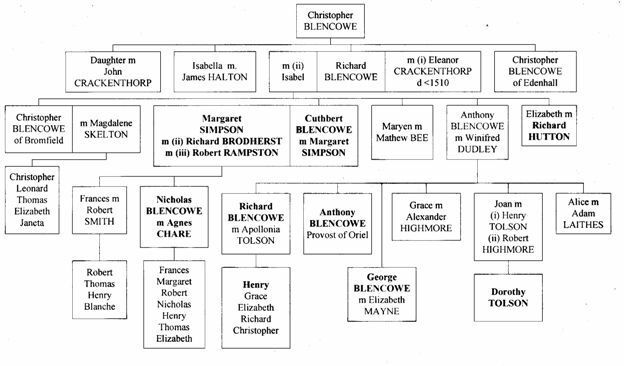 The following research by Thomas Grindley is of importance as it changes pages 180-184 of The Blencowe Families: Descendants of the Blencowe families of Cumbria and Northamptonshire. In correspondence with Jack Blencowe (Newsletter Vol.20 Nos,2 & 3) I told of my interest in the relationships of the Tolson family with Anthony Blencowe (Provost of Oriel College) and with Margaret Rampston. Both Anthony and Margaret had mentioned Dorothy Tolson as 'niece' in their wills; Margaret had a son Nicholas Blencow by a previous husband whose identity was unclear. I am uncomfortable with my previous hypothesis that Margaret was born a Blencowe and I believe ascribing Margaret as a daughter of Anthony Blencowe and Winifred Dudley is erroneous. law. The tree shows Margaret and her nephews Barnard and Rowland who are mentioned in her will. In the Blencowe pedigree (Fig. 2) I show her married to Cuthbert Blencow by whom she had children Frances and Nicholas. Cuthbert, who had previously been thought to have been unmarried, apparently died c.1553. I believe that Margaret remarried in 1557 to Richard Brodherst at Greystoke, however, the parish register does not record whether she was spinster or widow. She later married Robert Rampston who predeceased her in 1585. Margaret's position in the pedigrees would explain very well the various references in her will. Her connection with Hutton would be through her nephew Rowland Simpson, who was married to Anne Vaux, sister of Jane Vaux, who was married to Sir William Hutton brother of Sir Richard Hutton, mentioned in her will. One question remains that hopefully someone will answer. Margaret exhibited the Blencowe Arms on her tomb. Would she have been entitled to do that in right of her Blencowe husband if she had not been born a Blencowe?